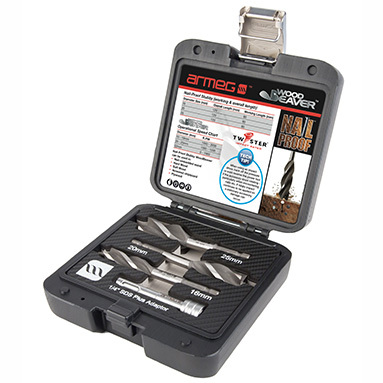 Armeg Nail Proof Wood Beaver (WWBNP4PCSET) - 4 Piece Stubby Set. Set includes: 16mm, 20mm & 25mm Armeg WoodBeaver Nail Proof Stubby wood drill bits and 1/4 inch SDS+ adaptor. Armeg WoodBeaver provides ultra-smooth and balanced cutting action, rapid drilling, extreme durability and exceptionally clean break through, thus maximising holes per charge. Designed with all the benefits of the standard Wood Beaver, the new Nail Proof version features a Bi-Metal cutting head for longer life when drilling in nail-embedded wood. The shorter Stubby design (120mm length) is ideal for inter-joist drilling, and working in tight, confined spaces.